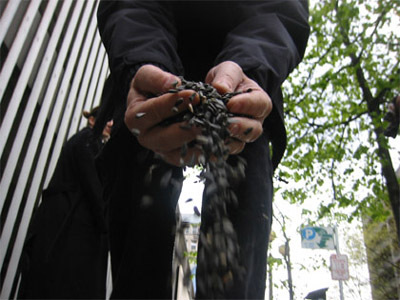 Watermark was a series of performances and installations about the potential impacts of climate change in Seattle. 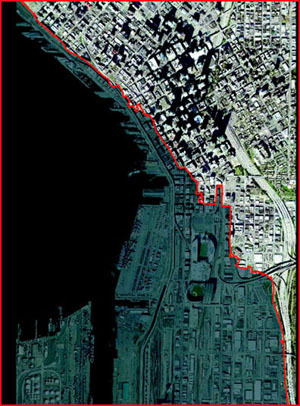 The Watermark actions marked the "new" Seattle waterfront that would be created in the case of a 20 foot sea level rise (as would happen if either the Greenland or Antarctic Ice sheets were to melt). 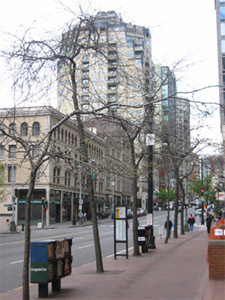 Participants walked along this waterline (the red line in the aerial photo of downtown seattle on the right), marking it with ephemeral materials such as seeds or melting blocks of ice. The walk was a meditation and a demonstration on the need for action locally, nationally, and globally to stem the tide of climate change. 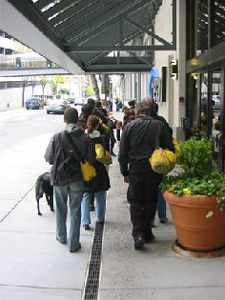 The project was launched on April 14, 2007 as part of Stepitup2007 actions, and repeated on Earth Day a week later. It continued as part of the show "Groundtruthing" at SOIL Art Gallery in August 2007, and was featured in EPA: Environmental Performance Actions at Exit Art in NYC in 2008. Graphic by Sarah Kavage. Map support & shoreline research from Brennon Staley. Photos from the first Watermark action. Participants used sunflower seeds (fish friendly, degradable & edible) to mark where the downtown waterfront would be in the case of a 20-foot sea level rise. Photos by Robert Zverina. 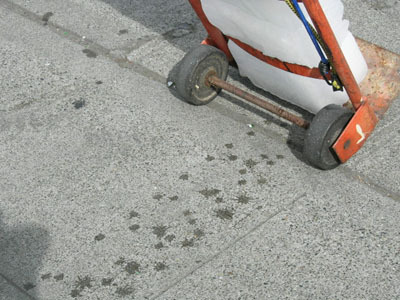 The photo at left is from a tour through the industrial district south of downtown (which would be dramatically affected by rising sea levels), using melting blocks of ice to mark the pavement. Photo by Darby Ringer. 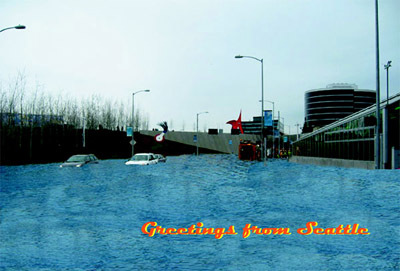 For the show at SOIL, we made postcards using photosimulations of places in Seattle that would be submerged in the case of a 20-foot sea level rise from climate change. The image at left is of the Olympic Sculpture Park (photosimulation by Nicole Kistler). Thanks to all the Watermark participants, Brennon Staley for mapping and gladhanding during the actions, and Robert Zverina for photo/video support.